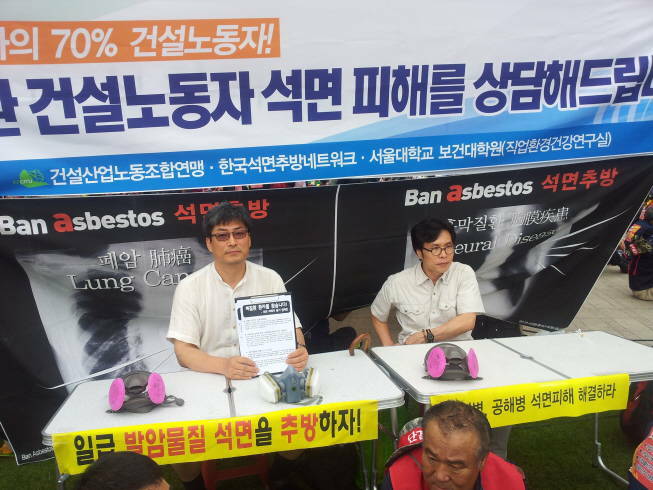 On Tuesday, July 22, 2014, a new initiative was mounted in the plaza in front of Seoul City Hall to raise awareness of the asbestos hazard amongst construction workers who constitute the vast majority of people diagnosed with asbestos-related diseases in Korea and elsewhere. 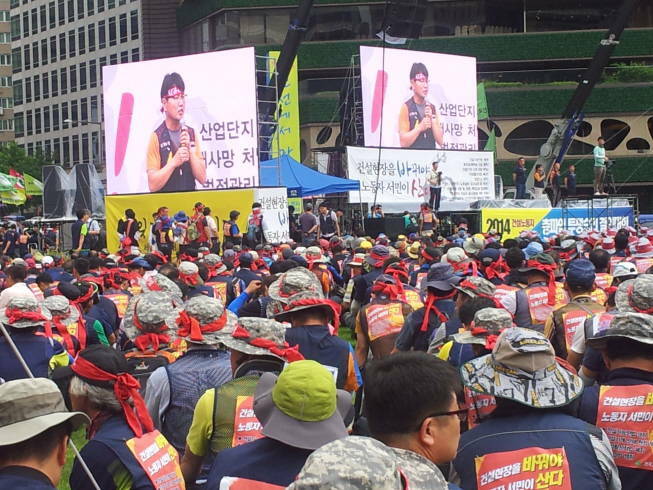 The three-hour afternoon event to publicize asbestos injustices experienced by construction workers was organized by BANKO in collaboration with the School of Public Health of Seoul National University and the Korean construction trade union. The event attracted more than 30,000 union members who heard calls for the introduction of new laws, improved working conditions and salary uplifts for people working in the construction industry. This manifestation was part of a new campaign to support people with occupational asbestos exposure claims that fall under the environmental relief system; the fact that these individuals are unable to claim benefits from the occupational insurance system, which are significantly higher than those they receive under the environmental relief system, perpetuates the injustice traditionally meted out to construction workers. 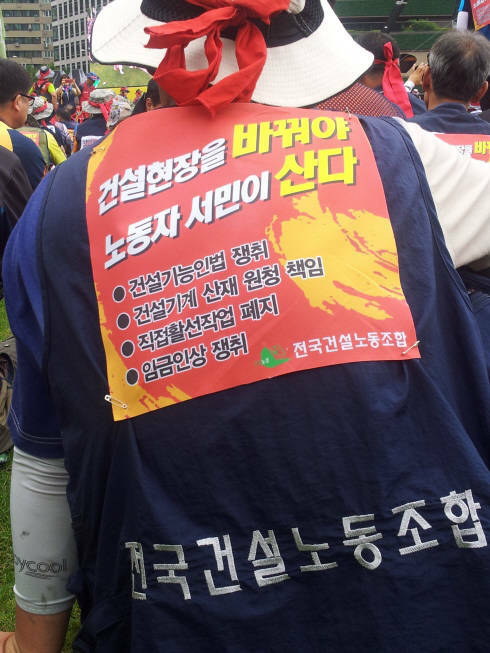 Seventy percent of Korean asbestos victims are construction workers and 64% of environmental victims whose cases are recognized by the environmental relief system were exposed to asbestos at work. Financial benefits for environmental exposure cases are 10-30% of those paid out under the occupational insurance scheme for the same asbestos-related disease. Most of the individuals penalized by this situation are retired workers who are unable to seek redress for this injustice. Data collected by BANKO shows that in 3 years, there have been 1,426 asbestos cases recognized under the environmental relief system; more than 700 of them should have attracted full benefits as paid out under the occupational insurance system. This underpayment of compensation equates to a saving of 56 billion Korean Won or more than US$50m.